I’m almost caught up on the Dismas Hardy books – 3 left but two are narrated by Robert Lawrence (and I’m used to Caldacci) and the other one is too much war stuff. I may go ahead with those anyway, but … There are 15 total in the series. Dismas Hardy is a San Francisco guy – he started out as a street cop with his buddy Abe Glitsky, but studied law and became a defense attorney. At the beginning of the series he’s quit the law now owns a bar and ends up returning to the law biz. The individual books are stand-alone legal thrillers (my favorite sub-genre) as far as the individual cases go but the life of Hardy has its ups and downs. 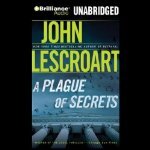 In A Plague of Secrets the manager of a coffee house near Haight Street is found murdered with a backpack full of marijuana. And next its found he has a criminal record with the possibility of old friends and he makes quite a lot of money for a coffee shop manager – even in San Francisco. But wait, who is that he lives with and what are her connections to him and another man? And who is that rich young owner the niece of – the mayor? As usual it gets complex with the rich and rowdy, the society sleaze-bags, and some good plain good folks thrown in. This one isn’t as good as Lescroart’s best, but it’s certainly not one of his worst.